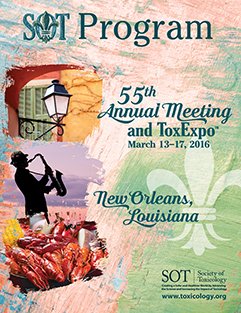 ePosters from the 55th Annual Meeting and ToxExpo can be viewed through May 11, 2016, by using the SOT Mobile Event App. If you do not already have the free SOT Mobile Event App, follow the instructions below to acquire it to view ePosters and other content for the SOT Annual Meeting and ToxExpo. Once you’ve downloaded the app, be sure to view the user tutorial within the app to learn how to use its features and tools. Open the App Store app and search for the app by entering SOT2016. You may be prompted to enter your user name and password. SOT Member registrants use their SOT membership login credentials to gain access. SOT non-member registrants use their email and password used to register for the meeting to gain access. At any time, use the password reminder on the SOT website login to have your password sent to your email address (the email address used to register for the meeting). Open the Google Play app and search for the app by entering SOT2016. Open the browser on the device. Online Planner: Access the Online Planner to build your custom schedule via the computer, download to print or sync with your iCal and/or sync to your device at any time. The Online Planner has optimal functionality using Chrome. You will be prompted to enter your user name and password. SOT Member registrants use their SOT membership login credentials to gain access. SOT non-member registrants use their email and password used to register for the meeting to gain access. At any time, use the password reminder on the SOT website login to have your password sent to your email address (the email address used to register for the meeting). 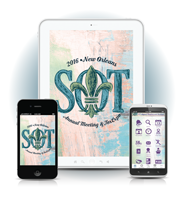 The SOT 2016 Mobile App is your all-in-one tool for managing your time and maximizing your experience at the meeting. With the app you have access to the Annual Meeting schedule, speaker details, abstracts (including the late-breaking abstracts), ePosters, attendee messaging, ToxExpo exhibitors and interactive floor plan, city and venue maps, New Orleans city guide, and the latest SOT Communiqué blog articles and much more. The app are restricted to SOT Annual Meeting registrants and SOT members. To register for the meeting visit the Registration section of the SOT Annual Meeting website. The following will provide you with some important usage information and a list of frequently asked questions (FAQ). The following devices are supported: Apple iPhone, iPad, Android smartphones and tablets (including Kindle). For Blackberry devices or Windows mobile smartphones users, the Mobile Event Website version is available. The Online Planner is available for those who prefer to create and manage their schedule via computer. The Online Planner has optimal functionality using Chrome. You can build your schedule and use the app features and tools from the iPad, iPhone, Android, Kindle, and the mobile website apps, and your schedule and media download items will sync between any of these devices and computers upon log in. The Mobile Event App and Online Planner will prompt for a username and password before allowing users to access the app, which include. Only SOT members and Annual Meeting nonmember registrants will have access to the app. SOT Member registrants use their SOT membership login credentials to gain access. SOT nonmember registrants use their email and password used to register for the meeting to gain access. At any time, use the password reminder on the SOT website to have your password sent to your email address (the email address used to register for the meeting). Access the Login Settings on the bottom menu bar to display the login/logout button. Your device will keep you logged in until you manually log out. As a service to Annual Meeting attendees, SOT will be providing free wireless Internet access in designated areas of the New Orleans Ernest N. Morial Convention Center. 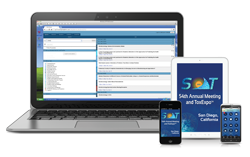 SOT is providing wireless Internet access to help attendees access the 2016 SOT Annual Meeting App and help make the Annual Meeting a more productive and enjoyable experience. To connect to the free wireless Internet, browse the available wireless networks and select the SOT2016 wireless network. When prompted for a password, use sotguest to connect to the network. Once connected, launch your web browser and the SOT welcome splashpage will automatically load. SOT will provide computers you can use to access the Internet. These computers are available to attendees in the @SOT center, located on the Ground Level of the New Orleans Ernest N. Morial Convention Center. All 2016 SOT Annual Meeting registrants have access to the messaging feature witin the app—offering you the opportunity to connect with fellow attendees by sending them messages within the app. The list includes each registrant’s name, employer, and job title for attendees once they have logged into the app the first time. The list of participants will grow as attendees access the app. You can manage your communication preferences and privacy settings in the Login Settings from the bottom menu options. SOT Annual Meeting registrants have messaging enabled. Use the Login Settings, via the gear icon on from within the bottom menu options, to manage your communication preferences. You can enable/disable messaging. You can also upload your photograph to display within the messaging in the app. Q: Since the app is available on several different devices, is one version better than the others? A: The best experience will be on the iPhone/iPad version and the Android version. Q: Is there a Blackberry or Windows Mobile app available? Or, can I simply use my computer to access the app? A: Yes, For Blackberry devicess or Windows mobile smartphones use the Mobile Website version at: http://ativ.me/sot16w. Online Planner is available to users who prefer to access the schedule and exhibitors via computer. Q: Is the SOT mobile app available to vendors and sponsors of the conference? A: Yes, vendors and sponsors are welcome to use the Mobile Event App as well as the Online Planner, however only SOT 2016 Annual Meeting registrants (including registered exhibitor personnel) have full access to the Mobile Event App and Online Planner. Q: Will the SOT Mobile Event App and Online Planner remain available after the conference has ended? A: The iPhone/iPad and Android apps will remain on your device until you delete it. The SOT app is available to download from the App Store and Google Play and the Online Planner will remain available until May 11, 2016.